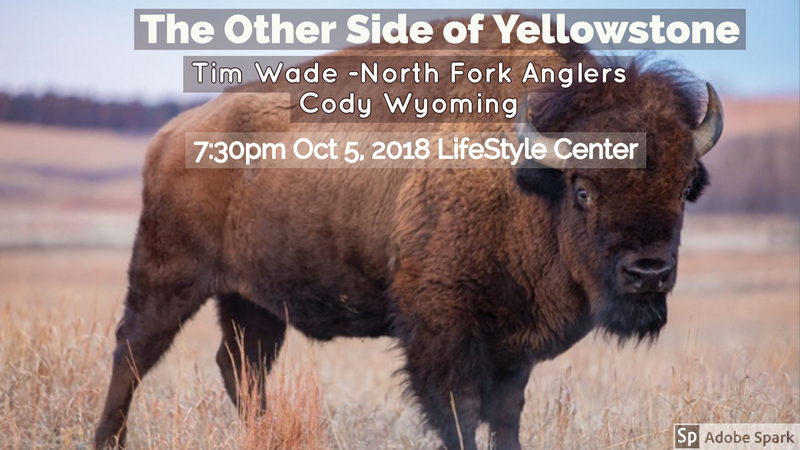 Tim Wade, owner and guide for North Fork Anglers, has been guiding, instructing and assisting fly fishers in the Yellowstone and Cody, Wyoming region for almost 35 years. Tim founded North Fork Anglers in 1984 and still loves to see his guests hook up with a native Yellowstone Cutthroat Trout, or fight a monster Brown on the Lower Shoshone. He has taught and written extensively about fly fishing, fly tying, fly casting and entomology, and shared his knowledge of trout behavior in speaking engagements across the country. He is fortunate to have some of the best fly fishing guides in the business working for him…all his guides love to fly fish, love to make their guests better anglers and love the wild trout resource in Wyoming and elsewhere. He specializes in instruction, casting and learning the water infinitely well. He is also an accomplished fly tier and has invented numerous trout and saltwater patterns, including the infamous North Fork Special and Ho Candy. 5:00pm Dinner with speaker. Denny’s 200 S. Akers St Visalia.